The #wordcountpodcast Episode 68 is now open for submissions! Been a long and trying month. My capacity to deal with issues is so incredibly diminished that sometimes the basics are all I can get through in a day. But enough of my #PityParty. You are here to read about, and see, the prompt for episode 68 of the #WordCountPodcast! This is a photo I took while hiking in Zion National Park in Utah in 2014. 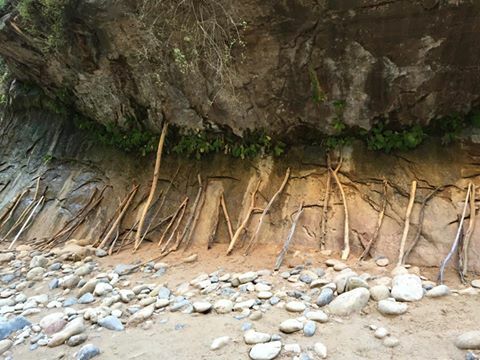 The shot is the beginning of the Narrows hike, previous hikers sometimes left their walking sticks for future hikers. That’s for your reference. The prompt will be the pic and the month of July. Make magic! There are sixty-seven shows available right now! DEADLINE: I must receive your submission by Friday 5 August 2017 by MIDNIGHT Eastern time. Send your file to me@rbwood.com (or via the dropbox link I can provide) by 5 August 2017. You can also e-mail me with questions beforehand. I do reserve the right NOT to post your submission, but will communicate that to you should it be the case. I add the ‘Explicit’ tag to the ‘cast, so if your story uses adult themes or language that’s ok—but it should be necessary for the story.